Prunus padus is a small to medium native tree with long slender racemes of white almond scented flower in spring followed by black fruits which are favoured by birds. 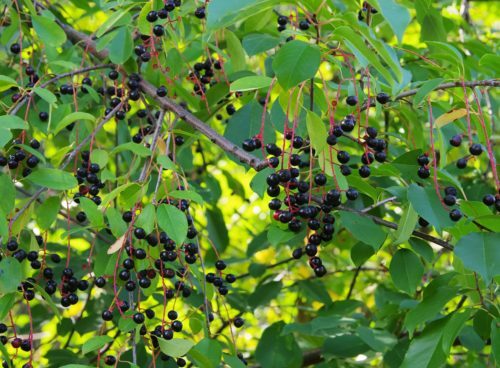 Bird cherry (Prunus Padus) as the name indicates is a favourite with birds for the black fruits which appear after the showy racemes of white almond scented flowers in spring. The green leaves turn an attractive yellow and red in autumn. The Bird Cherry is a small to medium sized deciduous tree growing at approximately 1ft (30cm) per year with very pretty long racemes of white flowers that exude a light scent of almonds in late spring. Although the small black fruits of the Bird Cherry which follow the flowers are favoured by birds such as the song thrush and blackbird they are also edible to humans if one can tolerate the bitter taste. The attractive racemes of the Prunus Padus tree which feed a host of butterflies, bees and insects are erect until fertilised when they then become more drooping and spreading. The Bird Cherry has oval serrated leaves which are dark green on top and slightly paler underneath, their stalks are a form of guard for the tree as when it comes under attack by aphids they emit an aroma which attracts aphid eating insects! The leaves of this versatile Bird Cherry tree become a glorious red and orange colour in autumn. Preferring moist but not waterlogged planting conditions Bird Cherry tolerate and in fact favour limestone based soil. The trees also grows well at the edge of woodlands and is often to be found in churchyards. Bird Cherry trees are during these ecologically friendly times enjoying a rise in popularity for planting schemes in the smaller garden reaching a height of approximately 35ft (11metres) While most Cherry trees hail from Japan the Bird Cherry is actually a native to the UK. If you have a rabbit problem we strongly recommend protecting newly planted Bird Cherry (Prunus Padus) with spiral tree guards. We will supply full cultural instructions with your order. We also recommend Rootgrow and Bonemeal to help establish newly planted Bird Cherry trees, these may be found on the left hand menu.